Adrian and the ipickmynose blog will be presenting a great show at Annie's Social Club this Wednesday, June 11. The show will feature three local bands - Geographer, Two Sheds, and Marabelle Pheonix - as well as Friday Mile from Seattle. 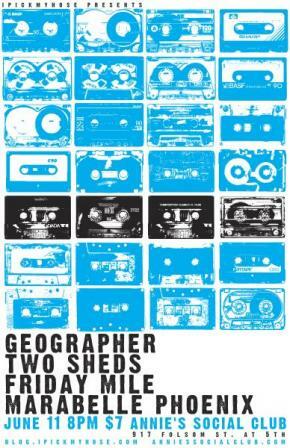 Appropriately, Geographer and Two Sheds have been getting a lot of love from the ipickmynose blog lately (among lots of other press). Geographer recently played an in-studio at KZSU, which Adrian promptly blogged about, and just a couple of weeks later, these events were repeated with Two Sheds. We also just featured Geographer in a Bay Bridged podcast episode. This show comes at an exciting time for both bands. Geographer is gearing up to release their debut album Innocent Ghosts in late summer and Two Sheds just released a new five-song iTunes-only EP. Both bands are also gearing up for tours of the West this summer. Marabelle Phoenix, meanwhile, will be playing shows all around San Francisco for the rest of the summer. For out of towners Friday Mile, this show is smack in the middle of their West coast tour, after which they'll put the finishing touches on a new project. They've got some live video up on Snowghost here. The show starts at 8pm and costs $7.